All around us, counties build and maintain the communities in which we live, work and play. Counties deliver on the critical infrastructure we depend on, including our roads and bridges, airports, waterways and ports, transit, passenger rail, water and sewer systems, hospitals, libraries and other public facilities. Counties keep us moving, keep us connected, keep our communities clean, and keep us safe and healthy. 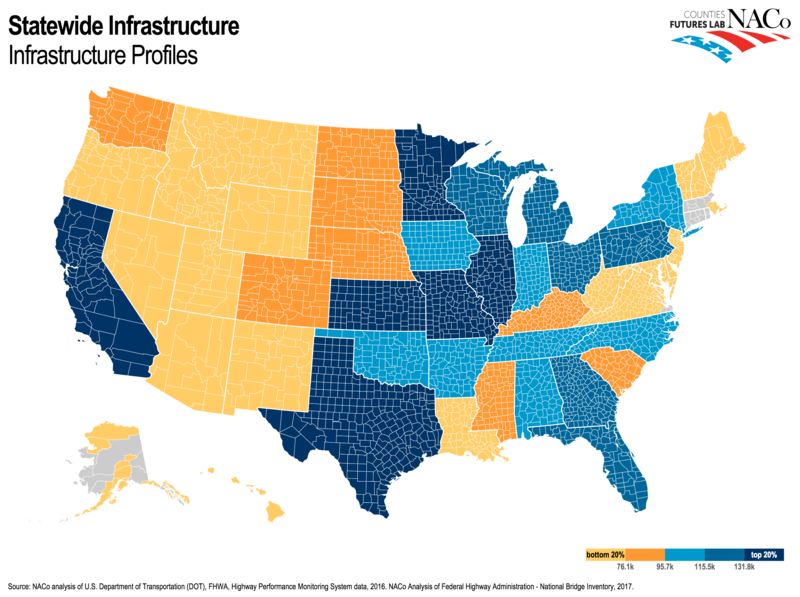 With more than 100 datasets and growing, NACo's County Explorer includes a number of datasets demonstrating the county role in our nation's infrastructure. Click here to explore, compare and learn about counties in the U.S.
Urge your members of Congress to support county transportation and infrastructure priorities in any new infrastructure bill presented by Congress. Senators and panelists agreed during committee hearing on the necessity of an adequately funded, long-term surface transportation bill. On November 21, the U.S. Department of Transportation Federal Railroad Administration (FRA) issued an order establishing new safety standards for railroad passenger equipment in an effort to stimulate U.S. high-speed rail development.